Considering the magnitude of state and federal agencies in existence today, it's no surprise that labor laws are constantly changing. 2019 has already issued several mandatory updates to labor posters. It's critical to understand how these updates affect your business's labor law posting requirements. At the LaborLawCenter™, we monitor every single labor law change for you, so it's easy for your business to stay in compliance. Please view the most up to date pages listed below. You can also simply submit your state and purchase date by using the form to the right. To check if your city or county has had a recent mandatory update, please click here. Are your posters up to date? Medical Leave Act Minimum wage revised to include new 2019, 2020, and 2021 rates. Discrimination Revised to include new 2019 minimum wages and governor name. New York Minimum Wage + Discrimination Revised with new 2019 minimum wage of $11.10 and new revision date. Certain cities & counties have labor law mandates that require an additional city/county specific labor law poster. All businesses with employees are required to post updated city/county labor law posters in addition to State & Federal posters. 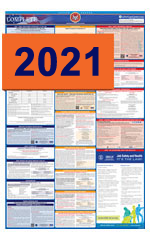 See the full list of city specific labor law poster requirements. and new tipped rate of $4.04 per hour. January 1, 2019 and new added phone number. wage rate of $13.50, effective January 1, 2019. State labor law updates are specific to the state an employer is working in and are passed by state legislatures. They occur in combination with the federal law, but often involve more broad issues existent in that specific state. Posting and keeping current with the state labor laws is a mandatory requirement. Update includes new regulation revisions as of August 2016 which includes text regarding nursing mothers and overtime rules. Update includes new regulation revisions as of August 2016 which includes the removal of penalty amount up to $10,000 against violators and revised contact numbers. See below to see a list of each state’s most recent mandatory poster updates. 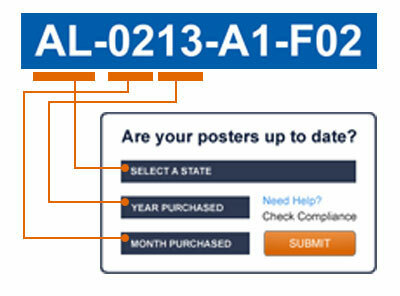 If you haven’t updated your All-In-One State & Federal labor law poster since the most recent revision date, click buy now to get in compliance with a fully up-to-date Complete Poster. Our labor law posters will always include all individual poster revisions shown below. Interested in an automated compliance service? Our Replacement Poster Program automatically ships new posters with every required update. Added 2019 minimum wage of $9.89 effective January 1st as well as a revised AK DoL email address. Updated to reflect new 2018 minimum wage rate of $9.84, effective January 1, 2018. Updated to reflect new 2017 minimum wage rate of $9.80, effective January 1, 2017. Updated to reflect new 2015 minimum wage rate of $8.75 per hour, effective 2/24/2015 along with new rules and regulations for industries exempt from minimum wage and overtime. This update also includes the 2016 minimum wage rate of $9.75 per hour, effective January 1, 2016. Updated with the new minimum wage of $11.00 per hour effective January 1st, 2019. Poster completely re-designed with new addresses and revised phone numbers. Updated to reflect new 2018 minimum wage rate of $10.50 effective January 1, 2018. New poster requirement for the state of Arizona, effective July 1, 2017. Updated to reflect new 2017 minimum wage rate of $10.00, effective January 1, 2017. Completely re-written with the new 2019 minimum wage, more information about tipped employees wages, compliance under the minimum wage law and various other information. Updated with new minimum wage of $11.00 per hour, effective January 1, 2018 to December 31, 2018. Revised to include the new minimum wages for 2019, 2020, and 2021. Updated to reflect new minimum wage rates for 2015, 2016, and 2017. Notice redesigned with information about the New Parent Leave Act effective April 1st, 2019. Revised to add 2019 and 2020 minimum wages as well as allowances for room and board under the minimum wage tab. Updated with new harassment training requirements for employers. Extensive change to the notice to clarify who is able to receive unemployment insurance benefits, disability insurance benefits and paid family leave as well as how to file a claim. Revision to simplify the language on how to file an unemployment claim as well as who qualifies for unemployment insurance benefits. Brand new minimum wage poster for Daly City. Updated with new minimum wage rate of $13.80 per hour effective January 1, 2019. Revised to include new minimum wage of $15 per hour effective January 1st, 2019. Revised with new 2019 minimum wage of $11.10 per hour and the new tipped employee minimum wage of $8.08 per hour. Updated to reflect new 2018 minimum wage rate of $10.20 effective January 1, 2018. Updated to reflect new 2017 minimum wage rate of $9.30, effective January 1, 2017. New posting requirement regarding pregnancy accommodations. Updated to reflect new 2016 minimum wage rate of $8.31 per hour, effective January 1, 2016. New poster requirement for the state of Connecticut. Update includes reformatting and new guidance for employees on where to file workers' compensation claims. Added veteran status as a protected class. Updated with more specific guidelines on when paid sick leave should be accredited to employees. Update to reflect new minimum wage rates for 2015, 2016 & 2017. Revised to include new 2019 minimum wages. Discrimination notice revised to include new information about Sexual Harassment, rights for disabled individuals, and rights for pregnant women. Updated to include new pregnancy accommodation laws, effective 1/1/2015. Updated to reflect new 2014 minimum wage rate of $7.75 per hour, effective 06-01-14 and new 2015 minimum wage rate of $8.25 per hour effective 06-01-15. Content has been updated including Dept. of Labor contact information. Completely new poster for the DC Paid Family Leave Law that explains which explains who is covered by the law and how the program works. Updated with new minimum wage rates effective from July 1, 2017 to July 1, 2020 and revised minimum wage and overtime exemptions. Update includes new poster "Pregnant Workers Fairness Act" requiring pregnant workers be given accomodations at place of employment. Updated Wage Theft Prevention Amendment Act now provides provisions to penalize employers who do not pay earned wages, effective February 26, 2015. Updated to reflect new 2014 minimum wage rate of $9.50 per hour beginning July 1, 2014. Update also includes the 2015 and 2016 rates. Revised with new fraud reporting website and a new revision date. Updated to reflect new minimum wage rate of $8.46 per hour effective January 1st, 2019 and new tipped rate of $5.44 per hour. Updated to reflect new 2018 minimum wage rate of $8.25 per hour, effective January 1, 2018. Updated to reflect new 2017 minimum wage rate of $8.10. Updated includes 'pregnancy' as protected from discrimination and changes to address information. Update includes the addition of an unemployment insurance website, an updated list of career centers, and a new revision date. Update includes new entitlement guidelines for injuries and new telephone number listing. Updated with new dollar amounts for compensation and additional telephone number. Update to Workers Comp “Bill of Rights” panel, changes were made in the financial compensation rate and omission of 800 telephone number. Weekly benefit amounts were updated. Updated with the addition of sibling as a protected class for use of family leave. Updated with new layout and additional information regarding OSHA, added logo and image. New address and phone number. Updated to reflect new 2015 minimum wage rate of $7.75 per hour, effective January 1, 2015. In addition, the minimum wage rate for 2016, 2017, and 2018 is also indicated on the Hawaii Minimum Wage Poster. New poster to inform women of the right to reasonable accommodations during pregnancy. Employment discrimination section updated to include "transgender and civil union" against employment discrimination practices. Change to website and contact information. New poster added detailing who is protected by the Illinois Servicemember Employment & Reemployment Rights Act and what benefits they have under this law. New Sexual Harassment and Job discrimination notice added which contains what harassment/discrimination is, employees rights, and contact information for the government agency in charge of enforcing these laws. Brand new mandatory posting of Pregnancy Accommodation law. Updated to reflect new minimum wage rate of $8.00 per hour effective July 1, 2009 and future increase to $8.25 effective July 1, 2010. Updated with new tipped wage and effective date. Added new 2018 tipped rate as well as the effective date of this new rate. Updated with newly added minimum wage information for non tipped workers and tipped workers and effective dates. Major revision to Equal Employment Opportunity is the Law, new texts, format, images, logos and email address. Reflects new minimum wage rate of $7.25 per hour effective July 24, 2009; Required poster dimensions have decreased and majority of content has changed. Updated to include new ways to file online and in person as well as revisions to both the website URL and various logos. Updates to "What does the Law Cover? ", "To Whom Does the Law Apply? ", "What Action Will an Agency Take? ", and Iowa Civil Rights Commission address. Reflects new minimum wage rate of $7.25 per hour effective January 1, 2009. Updated notice applies to dates of accidents on or after April 25, 2013. Also reflects changes to the number of calendar days to notify employers of injuries on the job and an updated website URL. Update made to content and phone number. New poster has been added. Reflects new minimum wage rates of $5.85 per hour effective June 26, 2007, $6.55 per hour effective July 1, 2008 and $7.25 per hour effective July 1, 2009. Updated to reflect new 2018 Earned Income Credit rates. Updated to reflect new 2017 rates. Updated to reflect new 2016 rates. Updated to reflect new 2015 rates and new website address. Updated to the 2014 Earned Income Credit, which includes revised income eligibility guidelines. Revised to include new minimum wage of $11.00 per hour, effective January 1, 2019. Updated to reflect new 2018 minimum wage rate of $10.00, effective January 1, 2018. Complete redesign of poster with more training information. Updated to reflect new 2017 minimum wage rate of $9.00, effective January 7, 2016. Update to workers' compensation to reflect new reporting guidelines for workplace injuries. Updated with new minimum wage of $11.11 per hour effective July 1, 2019. Updated with new minimum wage of $10.90 per hour effective July 1, 2018 and also new updated information on amendment of tip wages. New posting requirement for the state of Maryland. Update includes new protection clause in regards to gender identity and more guidance on wage transparency amongst employees. Updated to include statutory guidance for enforcement of law and new email listing added. Updated to reflect new minimum wage rate increase effective 1/1/2015 and followed by increases every July until 2018. Updated to include new poster regarding "Notice to Tipped Employees". Revised to add new minimum wages for employers with less than fifty employees and for those with over fifty employees. New poster with information about the Massachusetts Paid Family and Medical Leave Law and who is covered under this law. Updated with the new 2019 minimum wage of $12.00 and several minor clerical changes. New additional information includes pay deduction law, addition of pregnancy and gender expression as protected classes against discrimination, new rules on reporting pay, and domestic workers' right. New poster regarding new Earned Sick Time Law, effective 7/1/2015. Updated to reflect new 2015 minimum wage rate of $9.00 per hour, effective January 1, 2015, along with a new website listing and new department name. Also includes future minimum wage rates for 2016 and 2017. Revised to include new 2019, 2020, and 2021 minimum wages as well as the new governor and director names. Completely new poster added with information about sick leave coverage, accrual and usage. Updated with redesign of poster, including a new department logo and a requirement for persons with a disability needing accommodations for employment to notify their employers in writing within 182 days. Updated to reflect new 2017 minimum wage rate of $8.90, effective January 1, 2017. Updated to reflect new minimum wage rate of $8.50 per hour, effective January 1, 2016. Updated with new 2019 minimum wage of $9.86 and a new email/website for the MN Department of Labor and industry. Updated with new 2018 minimum wage rates. Update to Minimum Wage poster, revisions includes New Minimum Wage rates effective 8/1/2016 for Large and Small Employers, new rates for J-1 Visa workers. Updated to reflect new minimum wage rate of $9.00 per hour for large employers, $7.25 per hour for small employers, and $7.50 per hour for J-1 Visa workers, effective 8/1/2015. Updated to reflect new minimum wage rate of $8.00 per hour effective 8/1/2014. Updated to now include minimum wage rates. Revised to include new 2019 minimum wage rate of $8.60, as well as a reworded section on employee rights and those exempt from the minimum wage law. Poster was completely redesigned with new sections to explain when and how to apply as well as how to properly classify workers in Missouri. In addition, a new e-mail address, fax number and revision date were added. Updated to reflect new 2018 minimum wage rate of $7.85 effective January 1, 2018. Updated to reflect new 2017 minimum wage rate of $7.70, effective January 1, 2017. Updated to reflect new 2015 minimum wage rate of $7.65 per hour, effective 1/1/2015. Reflects new minimum wage rate of $7.35 per hour effective January 1, 2011. Updated to reflect new 2015 minimum wage rate of $8.00 per hour, effective January 1, 2015. Also includes the 2016 minimum wage rate of $9.00 per hour, effective January 1, 2016. Updated with revision to Title 219 Chapter. Changes include revised guidelines on receiving unemployment compensation. Updated the Wage and Hour address and logo. Includes new claimant's availability/work search requirements section; updated contact information; and logo was updated. Content and contact information including change of website. Updated to reflect a 2019 bulletin date as well as the new director. Revised with new information on where to file a Workers Compensation claim as well as new font requirements. More information added about domestic workers and their exemptions to the break and hour laws. Update includes changes to office address, contact info and new director information. Poster also reflects current calendar year of 2018. Effective January 1, 2018 employees who are direct or indirect victims of domestic violence will be eligible for 160 hours of leave to deal with related issues. Updated Protective Legislation Law to reflect new requirement mandating that wages be paid on a weekly or biweekly basis. New posting requirement regarding "Equal Pay" law. Reflects new minimum wage rates of $5.85 per hour effective July 2007, $6.50 per hour effective September 2007, $6.55 per hour effective July 2008, and $7.25 effective September 2008;Update in minor labor law section. Brand new poster explaining employee rights under the New Jersey Sick Leave Law. Updated with new 2019 minimum wage of $8.85 and revised to include new contact information for the NJ department of Labor. Updated with the addition of "breastfeeding" as a protected category and a new revision date. Complete re-design of poster as well as added language about overtime, tipped workers, damages, retaliation, minimum wage enforcement, local minimum wages, and more. Complete revision of previous poster. New format and regulations regarding workplace discrimination. New state-mandated posting on human trafficking. Content and contact information updated. Updated to reflect new minimum wage rate of $11.80 per hour. Revised to include new minimum wage of $9.05 per hour effective January 1, 2019. Updated with new minimum wage rate of $10.10 effective January 1, 2019 and new tipped rate $4.04 per hour. Updated with new minimum wage rate of $9.20 per hour effective January 1, 2019 and new tipped rate $5.50. Revised with new 2019 minimum wages and new revision date. New York's minimum wage will increase on 12/31/2017. In New York City, $13.00 for Large Employers (11 or more employees) and $12.00 for Small Employers (10 or less employees). In Long Island and Westchester County, $11.00. For the remainder of New York State, $10.40. New York's minimum wage will increase on 12/31/2016. In New York City, $11.00 for Large Employers (11 or more employees) and $10.50 for Small Employers (10 or less employees). In Long Island and Westchester County, $10.00. For the remainder of New York State, $9.70. Updated to reflect new 2016 minimum wage rate of $9.00 per hour, effective December 31, 2015. Added new Right To Temporary Changes to Your Work Schedule Notice and Sexual Harassment notice to the poster. Major changes to the form to add new “Safe Leave” provisions for all employees. Updated with new information and rewording. New posting requirement for the state of North Carolina. Update made to Right-to-Work Laws. Update made to Unemployment Insurance and N.C. Workers' Compensation Notice to Injured Workers and Employers (Form 17). Updated content to reflect employee/employer rights. Update includes statute revision on "Limitations on Paid Time Off" and other minor formatting changes. Update to “Minimum wage & Work Summary” which includes new details on “Limitations on Paid Time Off”, new guidelines to “Deductions From Pay” law & added civil code at the end of each state labor law, etc. Change made to poster content including effective date of poster's information. Updated to reflect new 2019 minimum wage of $8.55 per hour and new governor name. Updated to reflect new 2018 minimum wage rate of $8.30 per hour. Updated to reflect new 2017 minimum wage rate of $8.15. Updated to reflect 2015 minimum wage rate of $8.10 for non-tipped employees and $4.05 for tipped employees. Update to Ohio Minimum Wage reflects the 2014 minimum wage of $7.95 for non-tipped employees and $3.98 for tipped employees, new director, and updated guidelines for exempt individuals. Significant re-wording on how to file a complaint about discrimination and what classifies discrimination as well as an update to the contact information. Update to Workers Comp Notice, new guidelines on when to report work related injury/death, new employer responsibility guidelines & new telephone number listing. Update to Employment Discrimination to include genetics information as protected class. Update made to content and contact information. Updated with new 2018 minimum wage rates effective July 1, 2018. New posting requirement for the state of Oregon effective January 1, 2019. Updated to reflect new minimum wage rates, effective July 1, 2017 to June 30, 2018 and new information regarding Earned Income Tax Credit. Updated guidelines for Hours of Employment for minors, including school vacations, maximum hours per day/week, and work times. Revision made to the logo and text, changing the website URL. Reflects new minimum wage rate of $7.15 per hour effective July 01, 2007 and $7.25 per hour effective July 24, 2009. Revised to add new 2019 minimum wage of $10.50 per hour as well as several other minor clerical changes. Updated to reflect new 2018 minimum wage rate of $10.10 effective January 1, 2018. Update to minimum wage poster to reflect new 2016 rate effective 1/1/16 and new wage guidelines for tipped employees. Update is inclusion of brand new anti-pregnancy discrimination poster. Updated to reflect new 2015 minimum wage rate of $9.00 per hour, effective January 1, 2015. Complete redesign which includes pregnancy as a protected class, new ways to report discrimination and additional EEOC requirements for housing and public accommodations. Minor grammatical and clerical changes. Revised contact information to add a new phone number, e-mail and addresses for employers. Updated Labor Law Abstract portion, new guidelines/requirements given on E-Verify. New Posting requirement for the state of South Dakota. Update made to poster content. Major poster revision including a new title, language on when/how to report an injury, and a new required fill-in field. Update to Unemployment Insurance; very comprehensive update to include new information on website and guidelines on what documents to gather to apply and what telephone number to dial for more information. Updated to reflect revised Middle Tennessee address and minor content change. Updated to remove notification information as well as to add a new logo and revised contact information. Revised website address and added clarification about the assistance the Ombudsman Program provides. Effective 9/1/2013. 10 - Now adding Notice #10 of Workers' Compensation; board required. 7 - Now adding Notice #7 of Workers' Compensation; board required. Minor update to content and new revision date. New posting requirement regarding Reasonable Accommodation for Pregnant Employees. Revised to include new 2019 minimum wage rates and contact information. New Employment Protections for Victims of Crime notice which allows employees who are victims of crime to take time off. New posting requirement for the state of Vermont. Newly required poster for the state of Vermont. Updated with new minimum wage of $10.50 per hour effective June 1, 2018. Updated to reflect new minimum wage rate of $9.50 effective June 1, 2017. Poster revised with new EITC income threshold as well as a vastly expanded section on who qualifies for EITC and how to claim. Updated with new penalty rates, and a new revision date. Updated with new penalty amounts for violations. Update to state OSHA poster, revision includes new reporting guidelines on fatal and non-fatal workplace injuries. Updated with new Paid Sick Leave Law effective January 1, 2018. Updated with new guidelines on reporting various injuries at work, along with formatting changes throughout the poster. OSHA updated w/ new guidelines on how to handle job place accidents & guidelines on how to handle deaths at work. Updated with new reformatted poster with the 2019 minimum wage effective January 1st. Updated with new minimum wage rate of $12.35 per hour effective January 1, 2019. Updated with new minimum wage rate of $12.00 effective January 1, 2018 and updated Paid Sick Leave law. Update To Wage Payment Collection Act, revisions include addition of labor penal codes, additional guidelines for defining pay periods and new email listing. Updated to reflect new 2015 minimum wage rate of $8.00 per hour, effective January 1, 2015. Updated with a new section for businesses to list UI account information. New posting requirement regarding the Bone Marrow and Organ Donation Leave Act. Update to Unemployment Insurance, revisions include new application requirements, new telephone number, website link and department logo. Content and contact information has been updated. Large portion of content has been updated. Rewording to clarify who must opt in to the Workers Compensation coverage and who can choose to opt in to the coverage. New posting requirement for the state of Wyoming. Updated with new penalty rates and new revision date. Updated with new penalty amounts for workplace violations and new information on employee workplace safety rights.